"If we use violence we're punished, if we use international law we're punished, if we try to hold Israel accountable we're punished," Sam Bahour, a Palestinian-American businessman based in Ramallah, told VICE News. "I'm not exactly sure what Israel expects the Palestinians to do under occupation. But we would hope that the international community at least holds Israel accountable not to punish the Palestinians for doing diplomatic work — not only for the Palestinians' sake but also for the sake of the integrity of the international system of governance." Where now for Israel & Palestine? This volume brings together the voices and views of leading Palestinian, Israeli-Jewish, and European intellectuals, politicians, and activists who propose alternative approaches and "out of the box" thinking on the Israeli-Palestinian conflict. 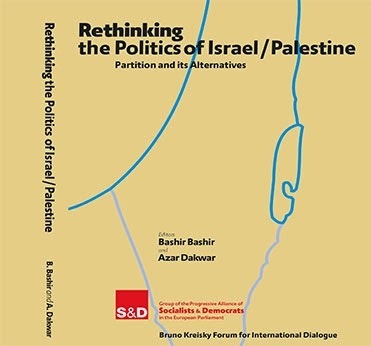 More specifically, this unique volume aims to contribute to the emerging efforts of re-examining the current strategies and paradigms through proposing and exploring new perspectives, visionary discourses, and alternatives to partition in the case of the Israeli-Palestinian conflict. Put differently, it seeks to enrich European public discourse with original and refreshing views and alternative paradigms to settling this lingering conflict. or download PDF version here. FIRST OF ALL, let me thank you for inviting me to address this important conference. I am neither a professor nor a doctor. Indeed, the highest academic title I ever achieved was SEC (Seventh Elementary Class). But like many members of my generation, from early youth I took a profound interest in archeology. I shall try to explain why. WHEN ASKING themselves about my connection with archeology, some of you will think about Moshe Dayan. After the June 1967 war, Dayan was a national – even international – idol. He was also known for his obsession with archeology. My magazine, "Haolam Hazeh", investigated his activities and found that they were highly destructive. He started digging alone and collecting artifacts all over the country. Since the primary aim of archeology is not simply to discover artifacts but also to date them, and thus to put together a picture of the consecutive history of the site, Dayan's uncontrolled digging created havoc. The fact that he used army resources only worsened matters. Then we discovered that not only did Dayan expropriate the artifacts which he found (which by law belonged to the state) and stock them at his home, but he had also become an international dealer, getting rich by selling articles "from the personal collection of Moshe Dayan". Publishing these facts and speaking about them in the Knesset bestowed on me a singular distinction. At the time, a public opinion institute identified every year the "most hated person" in Israel. That year, I attained that honor. HOWEVER, THE important question does not concern Dayan's morals but a much more profound matter: Why were Dayan and so many of us at the time concerned with archeology, a science considered by many people as a rather dreary business? It held for us a profound fascination. That Zionist generation was the first one born in the country (though I myself was born in Germany). For their parents, Palestine was an abstract homeland, a land they had dreamed about in the synagogues of Poland and Ukraine. For their native-born sons and daughters it was a natural homeland. They were yearning for roots. They trekked to every corner, spent nights around a campfire, came to know every hill and valley. For them, the Talmud and all the religious texts were a bore. The Talmud and other scriptures had sustained the Jews in the Diaspora for centuries, but evoked no interest here. The new generation embraced the Hebrew Bible with unbounded enthusiasm, not as a religious book (almost all of us were atheists) but as an unequalled masterpiece of Hebrew literature. Since they were also the first generation for whom the rejuvenated Hebrew was their mother tongue, they fell in love with the lively, concrete Biblical Hebrew language. The much more sophisticated, abstract language of the Talmud and other later books repelled them. The Biblical events had taken place in the country they knew. The Biblical battles had been fought in the valleys they knew, the kings had been crowned and buried in the localities they knew intimately. They had looked at night at the stars of Megiddo, where the Egyptians had fought the first recorded battle in history (and where, according to the Christian New Testament, the last battle – the battle of Armageddon – will take place). They stood on Mount Carmel, where the prophet Elias had slaughtered the priests of Baal. They had visited Hebron, where Abraham had been buried by his two sons, Ishmael and Isaac, fathers of the Arabs and the Jews. THIS PASSIONATE attachment to the country was by no means preordained. Indeed, Palestine played no role in the birth of modern political Zionism. As I have mentioned before, the founding father, Theodor Herzl, did not think about Palestine when he invented what became known as Zionism. He hated Palestine and its climate. Especially he hated Jerusalem, which to him was a foul and dirty town. In the first draft of his idea, which was addressed to the Rothschild family, the land of his dream was Patagonia, in Argentina. There, in recent times, a genocide had taken place, and the land was almost empty. It was only the sentiments of the Jewish masses in Eastern Europe that compelled Herzl to redirect his efforts towards Palestine. In his founding book, Der Judenstaat ("the Jewish State"), the relevant chapter is less than a page long and entitled "Palestine or Argentina". The Arab population is not mentioned at all. ONCE THE Zionist movement directed its thoughts towards Palestine, the ancient history of this country became a hot issue. The Zionist claim to Palestine was solely based on the Biblical history of the Exodus, the conquest of Canaan, the kingdoms of Saul, David and Solomon and the events of those times. Since almost all the founding fathers were avowed atheists, they could hardly base themselves on the "fact" the God had personally promised the land to the seed of Abraham. So, with the coming of the Zionists to Palestine, a frantic archeological search started. The country was combed for real, scientific proof that the Biblical story was not just a bunch of myths, but real honest-to-God history. (Pun intended.) Christian Zionists came even earlier. There started a veritable attack on archeological sites. The upper layers of Ottoman and Mamelukes, Arabs and Crusaders, Byzantines and Romans and Greeks and Persians were uncovered and removed in order to lay bare the ancient layer of the Children of Israel and to prove the Bible right. Huge efforts were made. David Ben-Gurion, a self-appointed Biblical scholar, led the effort. The Chief of Staff of the army, Yigael Yadin, the son of an archeologist, and himself a professional archeologist, searched ancient sites to prove that the Conquest of Canaan really happened. Alas, no proof. When remnants of the bones of Bar Kochba's fighters were discovered in Judean desert caves, they were buried on Ben-Gurion's orders in a big military ceremony. The uncontested fact that Bar Kochba had caused perhaps the greatest catastrophe in Jewish history was glossed over. Israel appears for the first time in sound archeological findings in Assyrian inscriptions, which describe a coalition of local kingdoms which tried to stop the Assyrian advance into Syria. Among others, King Ahab of Israel is mentioned as the chief of a considerable military contingent. Ahab, who ruled today's Samaria (in the north of the occupied West Bank) from 871 BC until 852 BC was not beloved by God, though the Bible describes him as a war hero. He marks the beginning of the entry of Israel into proven history. ALL THESE are negative pieces of evidence suggesting that the early Biblical story is invented. Since practically no trace whatsoever of the early Biblical story has been found, does this prove that it is all fiction? Perhaps not. But real proof does exist. Egyptology is a scientific discipline that is separate from Palestinian archeology. But Egyptology proves conclusively that the Biblical history until King Ahab is indeed fiction. Even if one would like to believe that the Bible only exaggerates real events, the fact is that not even a tiny mention of the exodus, the conquest of Canaan or King David has been found. They just did not happen. IS THIS important? Yes and no. The Bible is not real history. It is a monumental religious and literary document, that has inspired untold millions throughout the centuries. It has formed the minds of many generation of Jews, Christians and Muslims. But history is something else. History tells us what really happened. Archeology is a tool of history, an invaluable tool for the understanding of what took place. These are two different disciplines, and never the twain shall meet. For the religious, the Bible is a matter of belief. For non-believers, the Hebrew Bible is a great work of art, perhaps the greatest of all. Archeology is something entirely different: a matter of sober, proven facts. Israeli schools teach the Bible as real history. This means that Israeli children learn only its chapters, true or fictitious. When I once complained about this in a Knesset speech, demanding that the full history of the country throughout the ages be taught, including the chapters of the Crusades and the Mamelukes, the then minister of education started to call me "the Mameluke". I still believe that every child in this country, Israeli and Palestinian, should learn its full history, from the earliest days to this day, with all its layers. It is the basis of peace, the real Rock Of Our Existence. [*] Full title of the Kinneret College conference: "The Rock of our Existence – the connection between Archeology and Ideology"